Ask fellow campers about "Big Chief RV Park" and nearby attractions. All utilities worked fine, no sewer smell, good wifi. No trees above 6 feet - no shade. No train or traffic noise. Park is overgrown - needs mowing. The only place to put our trash was a big open construction bin at the west entrance. We would not stay here again. Everything was OK but there is no ambience. We camped at Big Chief RV Park in a Motorhome. Don't miss the Marland Estate and Grand Home tours. Also the Pioneer Woman statue and museum. Walmart is 5 miles north at 14th and Prospect. Like this park, plenty of room between campers, all sites pull-thru. Dirt/gravel base, graded level. 50Amp, water, sewage, $100 deposit for a cable box with good selection of channels and the option to rent a router from the cable company for hardline internet for those working from 'home'. Lots of workers here, employed at refinery or wind farms, but no noise problems noted. Storm cellar for emergencies - gun range - rental cabins border two sides. Nice people to deal with. Plan to stay there again! We camped at Big Chief RV Park in a Fifth Wheel. Long gravel/rock/grass/mud sites with wide grass separation. Good electric. Far distant train and highway sound. Dogs didn't seem to get any burrs in their feet while being walked. Good cable TV with $100 deposit cable box. That's where the good ends. Extremely slow WiFi/Internet. Hose bibs are below grade and at our site the dirt hole was almost too small to connect a hose and then filled with water. Other reviewer commented about smell of distant refinery but it was more likely the odor given off by all of the upcapped sewer connections. Placed a chunk of concrete over those on the adjacent sites. No picnic tables. Office doesn't open until 11 AM so must wait until then to obtain $100 cable box deposit refund. Showers cost an additional $5 at the office. Site surfaces vary from smooth to rutted with 3" rocks. We camped at Big Chief RV Park in a Motorhome. Stayed June thru Oct 2015. Friendly owners and workers in office. Owner is improving the looks of park with adding trees. Just need to improve sites with smaller gravel and not river rock. Very pleasant stay. Would stay again. 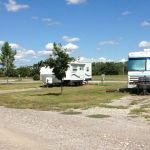 We camped at Big Chief RV Park in a Fifth Wheel. Shopping not to far. Many restaurants. Thru the summer a lake near by with a beach for family fun. Enjoyable area. We needed to stay in the area for one night to visit relatives. This worked for one night. It's more of a park for people working in the area. There are full hookups and water pressure is good, electric good, but we weren't using our a/c either. The trees are small yet so no problem with fitting on the site. The lady who checked us in was very nice, but didn't really know where the hookups were at the sites and her husband was gone. The down sides of the park is that it's close to the refinery so you get some chemical smell, that people let their dogs run loose or let them howl (I felt sorry for that dog), and some folks left their garbage on site after leaving instead of using the dumpster. Overall, the park was pretty clean. If I wanted to visit relation again, I might try to find something else, but would use this if I couldn't. 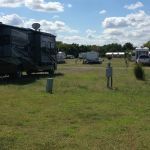 We camped at Big Chief RV Park in a Motorhome. Are you affiliated with Big Chief RV Park ?